There are a slew of health consequences that go along with carrying excess weight. It increases the risk of many problems, including heart disease, Type 2 diabetes, kidney disease and joint disorders. What’s more, research has linked weight and obesity to many types of cancers. As part of one study, researchers analyzed 204 previously published studies to explore a possible link between weight gain, obesity, waist size and 38 different cancers. The results, which were released in March 2017, found “strong evidence” supporting a connection between these factors and 11 types of cancers, including breast, ovarian, kidney, pancreatic, colorectal and bone marrow. A study released in 2016 had similar results, finding solid evidence of an increased risk for 13 types of cancer. Their list also included breast, kidney, ovarian and colorectal, as well as stomach, thyroid, uterine and multiple myeloma, a blood cancer. According to the chair of the group conducting this study, the 13 cancers they identified together account for 42 percent of all new cancer diagnoses. 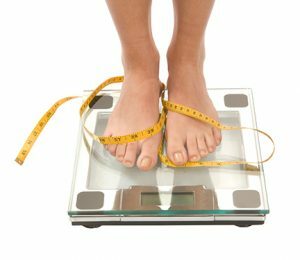 When studying the link between weight and disease, researchers generally use a measurement known as Body Mass Index, or BMI, which is a ratio of weight to height. A BMI between 18.5 and 24.9 is considered a healthy weight. A BMI of 25 to 29.9 is overweight, 30 or above is obese and 40 or higher is morbidly obese. In general, the higher the BMI, the greater the risk for health problems, including the cancers studied. There are several ways extra weight can affect the body and increase cancer risk. For one, it increases the levels of insulin and insulin growth factor-1. Higher levels of these substances may help some cancers develop. Also, obesity tends to affect immune system function, causing chronic, low-level inflammation, which is linked to an increase in cancer risk. People who are overweight also release higher amounts of certain hormones like estrogen, which can feed the development of cancers such as breast and endometrial. Finally, fat cells themselves, might have an effect on the way the body regulates cancer cell growth. If you need more convincing: The World Cancer Research Fund says excess weight contributes to as many as one out of three of all cancer-related deaths. Further, they estimate that about 20 percent of all cancers diagnosed in the US are related to body weight, physical inactivity, excess alcohol consumption and/or poor diet, and thus could be prevented. Does this mean all I have to do is lose weight and I’ll be fine? Actually, there’s been more research done on the link between weight and cancer risk than on the effect on risk of losing weight. What is known is encouraging and suggests losing weight is beneficial. Most researchers and health care professionals agree. Avoid gaining weight through your adult years. If you are already overweight, try not to gain any more, and it will certainly do you well to take off a few pounds. Losing weight will lower your risk for many cancers, and other health problems as well.